(Also spelled Wé'wha) Weiwha was born in the Zuni pueblo perched atop a mesa plateau, in one of the oldest continually inhabitated villages in the US, certainly in new Mexico. Weiwha lived a remarkable life and was recognized both for his many contributions to the life of his village as well as for his generosity in sharing the Zuni culture with the outside world. 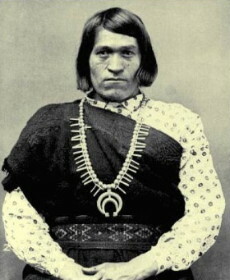 Weiwha was the subject of Will Roscoe's The Zuni Man-Woman, in which Roscoe explored the historical and cultural tradition of the Zuni Ihamana, or what anthropologists and ethnographers have termed berdache, and the Natives prefer to call "two-spirits". Encountered by many anthropologists and explorers, Weiwha was perhaps best known through the influence of Matilda Coxe Stevenson. Stevenson was one of the earliest women anhropologists and she wrote extensively about her interactions with Weiwha, eventually inviting him to Wasington in 1866. After making quite an impression on Washington (he was praised by President Grover Cleveland and others), Weiwha returned to Zuni, where he eventually died. In some Native American cultures, male children who display feminine characteristics at an early age are valued by the tribe as a sacred trust. It is believed that the Great Spirit has sent this child to them as a go-between for males and females, a bridge between the sexes who understands both sides of the human condition. Such a child is apprenticed to a shaman, or holy man of the tribe. In his training, he learns the traditional work of both sexes, dresses as a woman, and usually performs the functions of healer and arbiter for his people. He often marries a man. Berdachism must be seen as part of a rich and complex cultural system which incorporated sexual preferences into a multi-dimensional framework involving economic, social and spiritual dimensions - all of which contributed to its overall acceptance and integration within the community. When Europeans arrived in North America they were shocked that native peoples often interpreted gender differently from them. Not only were many cultures matriarchal, a great many tribes accepted three genders instead of two. 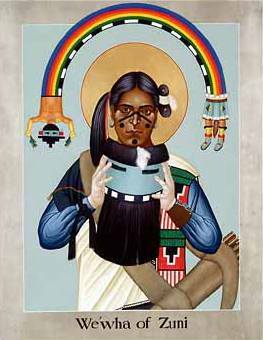 Zuni Pueblo, in western New Mexico, honored three genders before the coming of protestant missionaires. Men who chose not to become hunters and warriors became Ihamana, members of an alternative gender that bridged the other two. While they were initiated into male religious societies, they became crafts specialists and wore female garb. They were non-varriors who moved freely in the male and female worlds. Wé-wha was a Zuni Ihamana who helped bridge his culture and that of Anglo-americans. He was one of the first Zunis to experiment with new economic activities, something essential in the changing world of his day. As a Zuni cultural ambassador to Washington, D.C., he mixed with "high society", and no one guesses he was not a woman. He assisted Anglo scholars who came to record the ways of his people, and at the same time, resisted Anglo incursions when they seemed improper - once even ending up in Jail. He was a deeply spiritual person. In this icon he is shown garbed as the man-woman kachina, Kolhamana, a role he filled during his life. His handa and face are painted ceremonially and he is ready to plac the sacred mask upon his face. He was well loved throughout his life and his death brought grief to Zuni. The rainbow spirit above his head in the icon emphazises that he is now one of the holy ones who return to their people with blessings. His photograph hangs in the tribal museum today, and gay native Americans throughout North America remember him as a spititual hero and guide.